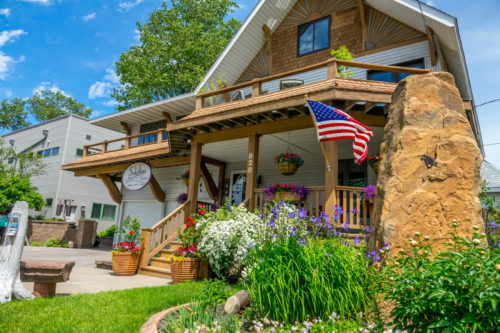 Visit Solglimt, on the shores of Lake Superior—you’ll forget you’re in a Duluth MN bed breakfast, yet it will be a getaway you’ll always remember. Even if you’re in town for work. Here, at your beach front bed and breakfast, we welcome you, we want you to be comfortable, and we await your arrival. Because of our size, cancellations affect us significantly. Therefore, we adhere to a strict cancellation policy. Cancellations, regardless of the reason, must be made 14 days prior to stay. Cancellations with less than 14 days’ notice will be charged to your credit card, unless we are able to rebook the suite. The initial $50 booking fee is non-refundable. Solglimt is not responsible for unused rooms due to late/canceled airline flights, travel related mishaps, threat of bad weather, or for changes in plans which shorten your stay. Travel Insurance is available to inexpensively protect you against last-minute cancellations due to such things as personal/ family emergencies related to work, illness, injury, or death. We recommend Travel Guard. Gift Certificates: We are happy to accept gift certificates issued by Solglimt at any time. Gift certificates issued the Minnesota Bed and Breakfast Association are accepted from November through May. Please mention that you will be using a Gift Certificate when making your reservation. Single night weekend reservations accepted November through April. A two-night minimum is required for Friday or Saturday reservations, May through October. Exceptions may be made five days prior to the weekend. Please call. Grandma’s Marathon Bookings: A three-night stay at the weekend rate is required for the weekend of Grandma’s Marathon. Days can include either a Thursday, Friday, and Saturday OR Friday, Saturday, and Sunday only. Solglimt is a smoke free bed and breakfast. Corporate customers welcome. Leave your hotel behind in favor of a Duluth MN bed breakfast. For more information, call Brian or Mary Grover (the owners/innkeepers) at 218-727-0596. Or e-mail us at grovers@solglimt.com You can also write to us at Solglimt Bed & Breakfast, 828 Lake Avenue South, Duluth, MN. Have our specials delivered to your in-box! Sign up for our quarterly newsletter for recipes, specials, and news on what’s happening in Duluth and at Solglimt.